The month of October has been pretty hectic for me. I have major activities at work (yes I'm a teacher just in case some of you don't know!) during October that really consume a lot of time. Some sacrifices had to be made and sadly my blog took a bit of the blow (huhuhu.. ). The results of my work was all worth it (I will share on some other time) but right now I'm just really happy that I'm back to blogging and super happy about it. 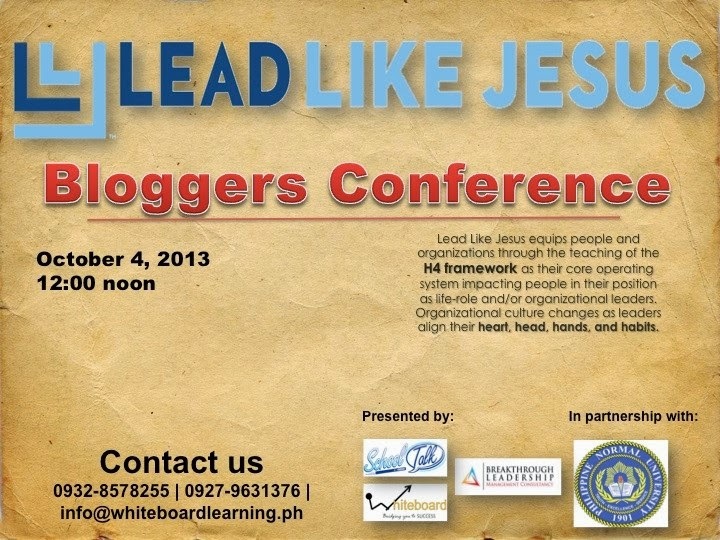 Anyway, one of the few blogger events that I was able to squeeze in the month of October was the Lead Like Jesus Bloggers Conference held at Eastwood. I was invited by one of my good blogger friends Daryll Reese. The title of the conference intrigued me at that time because well besides that I am a Christian, I also was interested in learning more about this unique type of leadership program especially since we've been receiving so much disheartening news about the failure of our government leaders with all the Pork Barrel Scandal. Anyway, I was glad to be able to go coz I really learned a lot and it sparked a bit of hope in me that maybe through this a new sort of leaders will rise up in our country. What is Lead Like Jesus (LLJ)? Lead Like Jesus aims to equip people and organizations through the teaching of the H4 framework as their core operating system impacting people in their position as life-role and/or organizational leaders. Organizational culture changes as leaders align their heart, head, hands, and habits. In other words, its a servant leadership program for youth, educators, and parents -- definitely a different kind of leadership program. Yes I know, Lead Like Jesus does sound like a church movement. But it is more than that. It is about LIFE. Changing one's mindset, attitude, and eventually one's life because of Servant Leadership. Its all about SERVANT LEADERSHIP. And one of the best examples of servant leadership is Jesus Christ (hence "Lead Like Jesus"). We need leaders who have the right HEART, HEAD, HANDS, and HABITS (H4 Framework). Through LLJ, people can learn more about the H4 Framwork which was created by the world renowned leadership expert, speaker, and consultant -- Dr. Ken Blanchard. He is the cofounder and Chief Spiritual Officer of The Ken Blanchard Companies & author of "One Minute Manager" (I've read that book and totally loved it!). Photo credit from Whiteboard Learning. Well right now, we can't do much to change the "attitude" of our leaders BUT perhaps through these type of training we can help train, shape, and mold our FUTURE LEADERS that will really have the heart and passion for our country. And that's what happened last October. 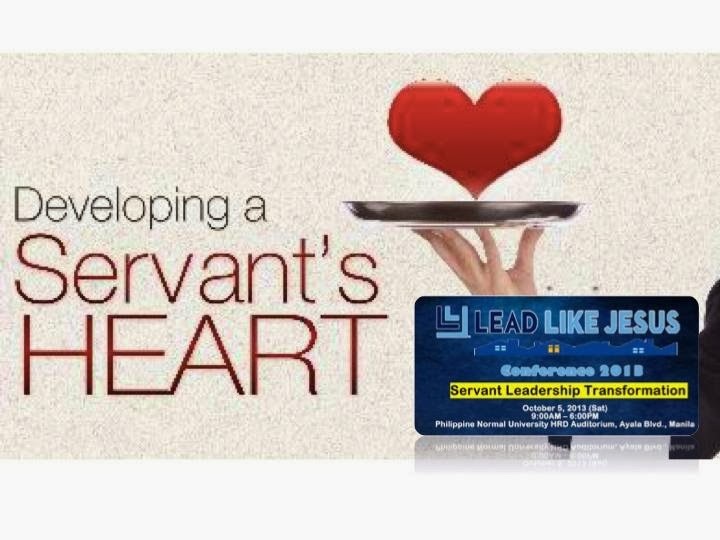 LLJ held a Servant Leadership Conference 2013 at the Philippine Normal University which was a whole day event that was facilitated by Mr. Jim Montgomery (Chief International Officer, LLJ) and Mr. Boris Joaquin (country leader and master trainer of LLJ Phils. and CEO of Breakthrough Leadership). The conference focused on emphasizing leadership paradigm exemplified through the life of Jesus. What he did, how he worked and dealt with the everyday environment. Country Leader and Master Trainer of LLJ Phils. School Talk is strongly convinced that servant leadership is a redefined kind of leadership principle that produces the best results on being a leader. They believe that this kind of virtue, inculcated to one’s personality can create the maximum potential for every individual, regardless of his or her state. As for me, I couldn't help but agree with School Talk's realizations about LLJ's "redefined kind of leadership principle." I wasn't able to attend the Servant Leadership Conference itself but during the bloggers conference by LLJ, I really learned a lot and was touched and inspired. It stirred up my heart as a teacher. If only this could be taught to ALL the young people from all walks of life -- imagine the impact they will have on our nation as the future leaders in our country! It is my desire to see our country transformed because we have upright, righteous, and God-fearing leaders in our land. And with what LLJ has presented, I could definitely see how this can be taught and applied in our country. Us bloggers were given a chance to question up close with Mr. Jim Montgomery and Mr. Boris Joaquin of LLJ to give light to some of the things you might want to know if you are interested in being involved in LLJ. LLJ has been in existence since 1999. LLJ is international. Their program, trainings, manuals, and resources have been translated to different languages already. And yes, I believe a Filipino translation of this is in the works. IGNITE is one of the materials that they are using that targets youth. IGNITE was just launched internationally here in Manila. LLJ aims to partner with schools (hence the School Talk connection). LLJ Philippines is currently partnered with Bible League. So if you want to get involved in LLJ, you may contact the Lead Like Jesus Philippines office at 889-1111 and look for Roxanne. You may also like to check out Whiteboard Learning or email them at info@whiteboardlearning.ph.